In 1985 – one year before the first stand-alone Chick-fil-A restaurant was built in Atlanta – the Chick-fil-A Chicken Biscuit made its debut. The arrival was part of a plan to, “offer the delicious taste of Chick-fil-A chicken throughout the day instead just lunch and dinner” with a distinctive Southern twist, said Shona Jonson, a senior manager on Chick-fil-A’s menu team. Jonson, who joined Chick-fil-A in 1999 (“I’ve made a lot of biscuits,” she says with a hearty laugh), explained that as the company expanded beyond its Southern roots, the idea of chicken for breakfast was a bit of a hard sell. “But once that little bite of deliciousness landed in their mouths, they were converted,” she says. The biscuit is now the top-selling entrée on the breakfast menu. Skilled and well-trained biscuit makers arrive before dawn – as early as 4:30 a.m. some days – to begin preparing biscuits for a 6:30 a.m. opening. The training program includes a thorough study of the recipe: techniques for mixing, rolling and cutting the dough, as well as how to perfect the art of cooking the biscuits to an internal temperature of 190 degrees Fahrenheit. It’s an intense but necessary regimen to maintain the quality and consistency of an iconic Chick-fil-A menu entrée. 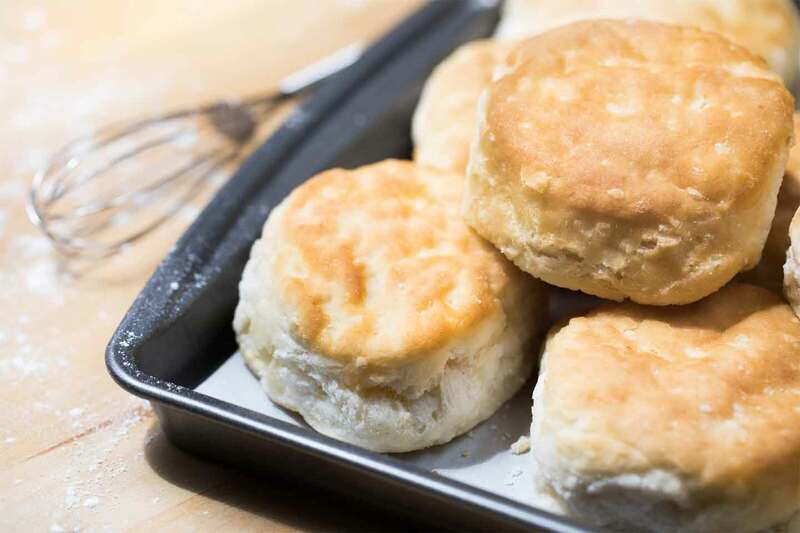 Jonson and her colleagues feel a responsibility beyond providing their guests with their favorite breakfast item: preserving the tradition of biscuit-making itself. When the culinary team was developing the biscuit 33 years ago, the goal was to create something that could pair well with the celebrated Chick-fil-A Chicken Sandwich. The result was a biscuit that was tender and flaky, but strong enough to hold up to the chicken (or sausage, or egg-and-cheese) filling. The recipe has remained consistent since its 1985 debut, with one significant tweak: trans fats were removed in response to customer requests.